Can Juggling Improve Your Brain? Keeping our brains alert and active is something we all want at any age, but especially as we move into the second half of life. Maintaining our memory skills, thinking ability, and mental clarity becomes more important to us. While preventing hearing loss is a major factor in preventing the degeneration of nerve cells, many other activities also contribute to ongoing brain development. One unusual example comes from an experiment that examined the brain cells of people learning to juggle. 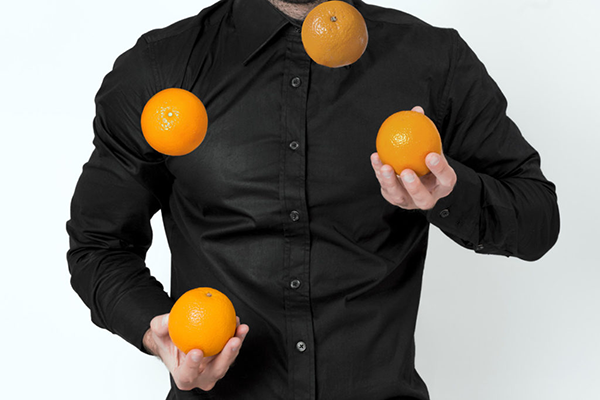 Why look at juggling to study brain activity? First, it’s not a skill many have mastered, or even attempted. Juggling is great exercise, it develops core strength, requires good eye-hand coordination and even relieves stress. Best of all, juggling turns out to be a great exercise for the brain. A study from the Department of Clinical Neurology at Oxford University examined the effects of juggling on the brain. Participants, who had never juggled before, were asked to spend only thirty minutes everyday over six weeks learning to juggle. The scientists quickly saw a 5% increase in white matter in the brains of these novice jugglers. After four weeks, brain scans continued to show increases of both white matter and grey matter in their brains. Numerous other studies found similar results, in both young and old participants —positive changes in the grey matter (the part of the brain that computes and processes information) and in the white matter (the parts of the brain responsible for internal communication). Grey matter, white matter, it all matters when it comes to keeping your brain active and alert. But Does It Have to Be Juggling? Does throwing heavy balls into the air and then catching them just not appeal to you? The juggling study authors feel that the positive brain changes in the participants mostly came from the time spent learning, training and participating in a completely new skill. It wasn’t that they mastered the skill of juggling and were ready to join a circus, but that they attempted to learn a complex new activity. If you want to keep your brain active, if you want to “use it and not lose it,” it doesn’t matter so much what you choose to take up, as long as it’s something different and engaging. Video gaming with your grandkids, board games with the family, water aerobics, taking a different route on your daily walk, appropriate snow sports, joining a book club — the possibilities are endless and exciting! The caring staff at The Hearing Solution is here to help you in your quest to keep your brain alert and active. A hearing assessment in our serene Sacramento office setting is a key step in navigating the aging process with information and professional experience on your side. We look forward to seeing your new juggling skills!